A celebration of dreams was the theme at Cheyenne-Eagle Butte School on Thursday evening, January 24. The celebration gathering was scheduled to recognize C-EB 5th grade students for completing the Lakota Circles of Hope program. The evening was filled with traditional food, presentations, gifts, and encouragement. For the past five years, C-EB School has implemented the Lakota Circles of Hope prevention curriculum and through the program students, learned about using Lakota culture and traditions to effectively cope with and overcome risky behaviors such as with bullying, suicide ideation, and substance use. To begin the festivities, the Lakota flag song was performed by a group of students, led by Lakota Language Teacher Dewey Bad Warrior. 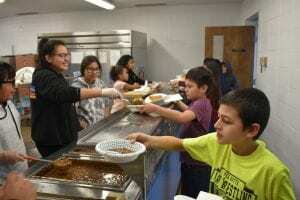 Afterward, 5th grade students eagerly volunteered to serve dinner and happily passed out bowls of beef stew, along with pieces of frybread. A cake decorated with the four sacred colors read, “Celebration of Dreams”. After dinner, Principal Petersen spoke about the importance of the program and how it has positively impacted student behavior and learning. Mrs. Berndt then spoke about the night’s theme: dreams. She said that students wrote essays about their dreams, in which they outlined how their planned to achieve their dreams, and how their dreams would help their community and family. Afterward, 5th grade students were invited to take center stage to share their dreams with everyone. One by one, students proudly talked about their future plans- they included becoming a professional athletes, paleontologist, and a baker. The students’ speeches ended to applause. Science Teacher Shelly Schuler then spoke to the students about hard work and perseverance. “Your dreams don’t just come true just like that. If you don’t put the effort into your dream, your dream won’t come true. You can dream out this world, but you are going to have some steps that you are going to have go through. You have to do the work to make them come true. Dream the dream, and dream them big, and then do the work that makes them come true. Everybody deserves their dream to come true,” said Schuler. 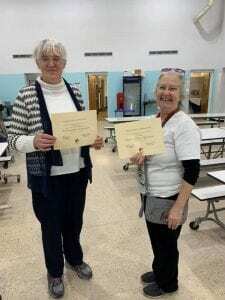 The evening ended with a speech from a Lakota Circles of Hope representative who thanked the parents for attending the event, and to Principal Petersen and JoEllen Berndt, who were each given Certificates of Appreciation for their dedication and support.